Findings in the town’s annual communications survey show social media as the top source where citizens accessed information about the Town of Taber in 2018 at 72 per cent, displacing local print media which led the pack in 2017 with 65 per cent of respondents. In 2017-2018, the town saw two surveys released to the public asking for opinions and suggestions on current Town of Taber communications initiatives. In 2018, 50 per cent of respondents agreed they felt well informed about the town’s operations, compared to 43.1 per cent in 2017, resulting in an increase of 6.92 per cent. This was tempered, however, by a decrease in those who strongly agreed (7.1 per cent) and an increase in those who disagreed (2.82 per cent). Of special note was the demographic constraints to the survey — which were highlighted by communications coordinator Meghan Brennan in her Jan. 28 presentation — showing the 2018 survey saw 101 responses, constituting a cross section of only 1.2 per cent of Taber’s population. 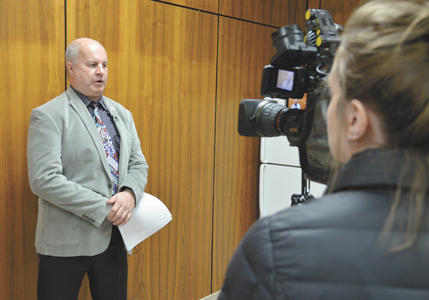 While the numbers collated in the survey are useful, Brennan hopes for more participation in future years to enhance the statistical significance of the results in relation to Taber’s wider population. In 2017, respondent’s access of local print media exceeded all other sources for information — including the town’s Facebook page — by at least five per cent. In the 2018 survey, those numbers have slipped significantly by almost 26 percentage points, with the town’s Facebook page showing growth over 2018 to take the lead at roughly 72 per cent of respondents. While more people may be accessing information about the town on social media platforms, the survey results did show that not everyone is altogether trusting of the origins of that information. Roughly 35 per sent of respondents indicated they were ‘somewhat likely’ to access the town’s new live streaming of town council meetings in future. Results would also show a likelihood for town citizens to participate in surveys (59.79 per cent), open houses (46.43 per cent) and public workshops (46.25 per cent). However, in the area of how the public perceives current town efforts to allow citizens to get involved, the majority of respondents (62.03 per cent) do not feel the town does so often enough. The town’s Communications Plan was approved by council in summer 2018. This was also reviewed with Brennan in a follow-up Communications Plan Six-Month Report which highlighted various successes, setbacks and goals in association with the town’s communications.